Dubai has transformed itself a lot from being a land of sandbanks to the conurbation of skyscrapers. Being entitled for the city having the largest building, largest hotel and largest shopping mall of the world; Dubai also has the largest man-made marina of the world. Dubai Marina is the largest marina which is beautifully flanked by Jebel Ali and Al Sufouh. With more than 200 sky-high towers, including 40 towers of Jumeirah Residence, Dubai Marina is a ludicrous panorama that portrays the brilliance of architecture and construction. Dubai Marina is absolutely stunning. Stretched across a wide area, it is surrounded by a wide variety of restaurant, hotels, parks, gardens, children’s play areas and shopping malls. Dubai Marina is an absolute wonder. The place is relatively expensive as it specifically serves high-end customers, however you may plan a visit or holiday for a special occasion. Dubai Marina offers an ultimate extravagance and glamorous lifestyle that one could ever dream of. The 7 most exciting things to do in Dubai Marina are mentioned here. Dubai Marina is surrounded by elite towers and beachfront five star hotels. You can enjoy a lavish family, couple and individual stay in a luxury hotel of your choice in Dubai Marina. The beachfront five-star hotels situated in Dubai Marina include Hilton Dubai Jumeirah, Amwaj Rotana, Sheraton Jumeirah Beach Resort, The Ritz Carlton Hotel Dubai, Habtoor Grand Beach Resort & Spa and Le Royal Meridien Beach Resort & Spa. Other five star hotels within the Marina premises include The Address Dubai Marina, Grosvenor House and Movenpick Hotel Jumeirah Beach. A stay in one of the luxury hotels in Dubai, is certainly one of the best things to do in Dubai Marina. Located in the vicinity of Dubai Marina, the Dubai Marina Mall can fulfill your considerable shopping needs. Relatively smaller in size, the mall yet has a good variety of shops as well as food courts, children’s play area, activity center and beverage and food outlets such as KFC, Subway, McDonalds, Baskin Robbins, Burger Kings, etc. You may also find the outlets of all the famous clothing, fashion, health, beauty, shoes and accessories brands. For the ease of your casual grocery shopping, located there is Waitrose supermarket. The top level of the Dubai Marina Mall is a dock for cinemas where you can enjoy your favorite newly released movies. Reel Cinemas have two hi-tech cinemas. This include one 6-screen cinema located in Dubai Marina Mall whereas the other 10-screen cinema, which is situated at ‘The Beach’. This offers you having a great experience while leaving your kids at the children’s play area or activity center located on the same floor. If you are sporty and specifically fond of Golf, then Dubai Marina can gratify your passion too. Located in the proximity, are the two advanced and high-end Golf Clubs that allow premium customer to play and watch the game, while enjoying their luxurious lifestyle to the utmost. You may easily reach The Faldo Course and The Majlis Course at the Emirates Gold Club and The Montgomerie. For golfers, visiting the clubs is one of the top things to do in Dubai Marina. Dubai Marina offers a number of water activities, however Yacht Jaunt is the most preferred among all. You can hire a personal yacht for your family to enjoy the beauty of the an Arabian ocean. The free waves of the ocean and unruffled breeze are truly soothing there. Yacht Jaunt is one of the most memorable experience and recommended activity that you may enjoy at Dubai Marina. The dancing fountain of Dubai Marina is very eminent. The maneuvered light and water show of the fountain is equally liked by adults and children. You may also enjoy Shisha, tapas and cocktail over the place. The beautiful crafted water show is one of the most sought after attraction of Dubai Marina. The Dancing Fountain is also one of the recommended things to see in Dubai. 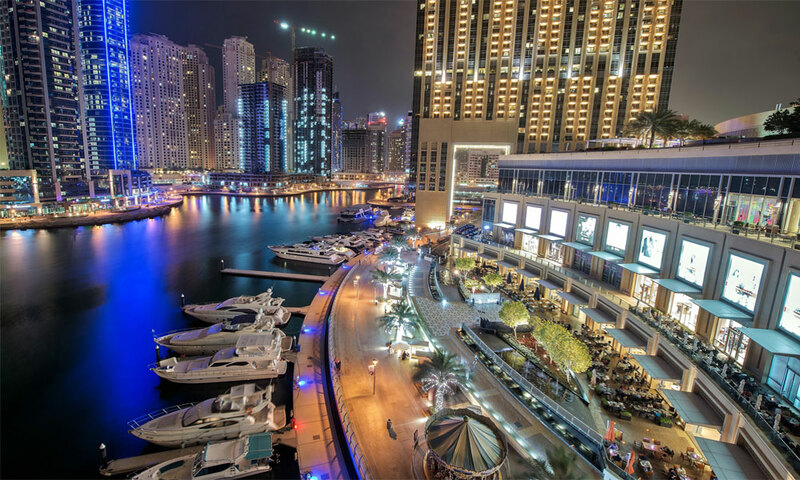 The Dubai Marina walk could be one of your most favorite reverie. Walk around the shoreline is ultimately comforting to spend a quality time with your family and partner. The Dubai marina walk is equally idyllic for jogging, walking, strolling and cycling. These are the best things to do in Dubai Marina which you should try. You might be interested in knowing activities in Dubai which we have covered in the top 10 things to do in Dubai. If you want to recommend an activity, please do so by adding comments below.